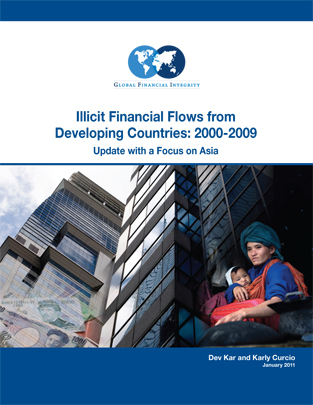 This January 2011 report from Global Financial Integrity, “Illicit Financial Flows from Developing Countries 2000-2009,” finds that approximately US$6.5 trillion was removed from the developing world from 2000 through 2008. The report also examines illicit flows from Asia, which produced the largest portion of total outflows. The report ranks countries according to magnitude of outflows with China ranking 1, Russia 2, Mexico 3, Saudi Arabia 4, and Malaysia 5. The report also shows the annual outflows for each country and breaks outflows down into two categories of drivers: trade mispricing and “other,” which includes kickbacks, bribes, embezzlement, and other forms of official corruption.